There is no shortage of New Year’s celebrations in the High Country this year. If you’ve not made plans yet, check out our list of all the events and fun times ahead! Ring in an epic New Year on Grandfather Mountain with the first sunrise of 2019. On Tuesday, Jan. 1, the mountain will host another New Year’s Sunrise event, offering guests the chance to start off their new year on a literal high note! Plus, attendees will be able to join in complimentary coffee, cocoa and bearclaws with their fellow early risers. 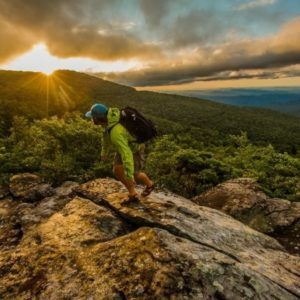 Sunrise is at 7:38 a.m. Jan. 1, 2019, and Grandfather’s gates will open at 6:30 a.m. Due to safety regulations, participants may only visit the Mile High Swinging Bridge area during the event. Click here for more information. 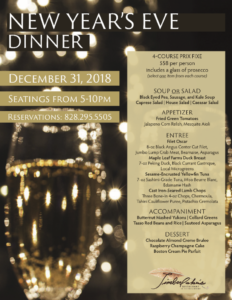 Join Timberlake’s Restaurant at Chetola Resort for a four-course prix fixe dinner on New Year’s Eve. Call 828.295.5505 for reservations or click here to learn more! Looking for something fun to do on New Years Eve? 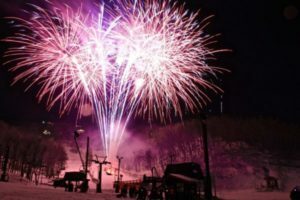 Ring in 2019 in style at Appalachian Ski Mountain in Boone, NC! There will be fireworks, torchlight skiing and more! Not a fan of skiing? There will be moonlight ice skating offered from 9:30 pm to 11:30 pm. Festive Restaurant Specials also available from 9pm to midnight. Click here for more information! 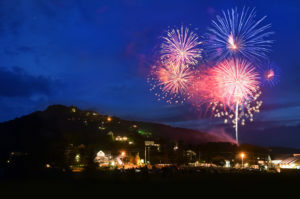 Ring in the New Year with Beech Mountain Resort! 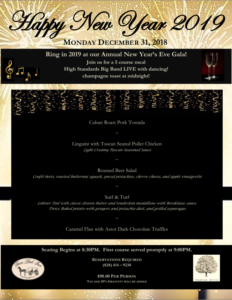 New Year’s Eve 2019 at Beech Mountain Resort has something for everyone. The night features live music from SoulPlay, drinks, eats, fireworks and more starting at 7:00 pm! . Click here to learn more. A New Year’s Eve celebration mountain style at Sugar Mountain Resort! 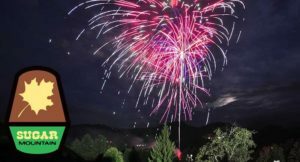 The general public is invited, free of charge, to an alpine torch light parade at 11:45 p.m and the fireworks show at midnight. Be sure to make reservations for indoor festivities from 9:00 p.m. until 1:00 a.m. featuring live music by The Rockabilly’s. Click here to learn more!